I am sorry that I haven't written in a while. We had company from Michigan for a week and I stayed busy with them. Then we had an art show last weekend. Getting ready for the show and taking care of things after the show has consumed several hours of my time. In this shot, you can see I have begun to add greens to the cooler areas of the image. I used Permanent Sap Green and some more Aureolin Yellow. It is really important to continue to soften some of the edges. This keeps your work from looking flat. When all of the painted edges look crisp, the painting will have a flat, graphic look. Nothing wrong with that, if that is your goal, but for me, the goal is realism. So, I like to vary the edges just as I see them in nature. Take a look at the class schedule which starts in February. 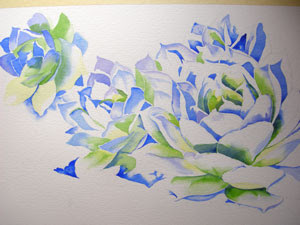 I am offering both Level One and Level Two watercolor classes as well as a drawing class. Click here to visit my classes page on my website.